Yasuo Kuniyoshi – Festivities (1947), oil on canvas, 100.5 x 176.5 cm, Okayama Prefectural Museum of Art. The most enigmatic-looking of Kuniyoshi’s works are those he produced in his twilight years after the war. In particular, the series of landscapes beginning from around the time of Festivities End (1947) are infused with a mysterious unfathomable quality that makes one wonder how he came to produce such paintings. In the first place, what on earth is this Festivities End a painting of? The slope of brown earth extending into the distance is desolate and at a glance gives the impression of a desert devoid of people. But in the left foreground stands a single lead-gray telegraph-pole-like object from which hangs a naked blue light bulb, while the right half of the background is almost completely covered by what appears to be a temporary shelter. Meanwhile, the part where an arrow and letters of the alphabet have been painted in a way that resembles a sign suggests an off-season entertainment district or public beach. The upended wooden horse that takes up most of the canvas reinforces this impression. I’ll bet there was a merry-go-round here. But be that as it may, why is the wooden horse lying on its back? Based on the absence of a protective covering and above all the fact that the shaft piercing the horse’s back and abdomen seems to have been burned at one end, it is clear that the facility has not been closed temporarily. The way the decorative rope is wound from the horse’s front leg to the shaft and cut off near the knees of the back legs also puts us in mind of an irreparable ruin as opposed to an off-season scene. The sky is blue, the wind seems to be strong, and in the background the wreckage of what appears to be a tent is scattered about. As well, for some reason or other, a figure resembling a woman in a red skirt is lying on the ground with an expression that seems to suggest nothing untoward has happened. As the work is titled Festivities End, perhaps it depicts a scene after the end of a festival of some kind. Then again, considering that Kuniyoshi began working on this painting during the war, and that, in contrast to Shimizu and others who devoted themselves to the production of war paintings in support of their homeland after returning to Japan, he remained in the US as an “enemy alien” and cooperated with America’s anti-Japanese propaganda effort through his painting, it is conceivable that the “festivities” in this painting are an allusion to the frenzy of the war that tore apart both his homeland and the US. Perhaps this is why there is something about the scene that calls to mind a place burnt down after an air raid. Of course, assuming that this is the case, given the elements that make up the painting, it could not possibly be a scene in the vanquished nation of Japan. It almost seems, then, that it was the US that lost the war. Particularly in light of the air of gloominess that hangs over the entire painting, one cannot sense here any of the festive mood peculiar to victorious nations. Exactly what was Kuniyoshi thinking? Yasuo Kuniyoshi – Girl, Run for Your Life (1946), casein on plasterboard, 35.5 x 58.8 cm, Fukutake Collection. Speaking of mysterious, in Girl, Run for Your Life (1946), completed the year before Festivities Ended, the artist’s true motives are also extremely difficult to discern. Again we are presented with an almost apocalyptic landscape in which most of the sky is covered in thick, gray clouds and buildings are dotted like burned-out ruins along the horizon. The burned-out impression is accentuated by the absence of telegraph wires and the fact that in places the telegraph poles are broken off and seem to have been stuck into the ground like hastily made grave markers. But what on earth are we to make of the praying mantis and locust, so gigantic they call to mind monsters? Because they are depicted facing each other, they look as if they are in the middle of a one-on-one fight. But do praying mantises and locusts actually eat each other? Isn’t the locust preyed on by the praying mantis? In which case, isn’t the scene in this painting like a brontosaurus planning a desperate charge against a meat-eating allosaurus? It’s no wonder the woman in the white dress seems so desperate to escape that she appears on the verge of falling over. Judging by the title, Kuniyoshi is ordering this girl, “Run for your life!” And so well he might. If she remained in such a place, no amount of life would be sufficient. But even so, why does a young girl have to be witnessing this scene in the first place? Equally mysterious is Here is my playground (featured in the last installment of this column). With red as the dominant color, the foreground of this painting again calls to mind ruins, but there are no signs of the charred remains peculiar to the scene of a fire and the impression is of a post-tsunami landscape where debris has piled up in a disorderly manner. The large object with a hole in it depicted on the left appears to be caught on a piece of driftwood or something. Judging by its appearance it is not a flag, but it could perhaps be compared to a Rising Sun flag that fell to the ground on the occasion of Japan’s defeat in the war. And here, once again, Kuniyoshi has included a lone young girl. Wearing a dress, she is hanging from what appears to be a wooden window frame with her hair trailing behind her, and based on the title it can be assumed she is playing. In fact, however, it is not certain whether this figure is human – because it is too small in comparison with the objects depicted in the painting. It would perhaps make more sense to interpret it as a girl’s doll attached to a panel complete with a wooden frame. It goes without saying, however, that such a simple analogy is completely meaningless. Because Kuniyoshi’s landscapes from this period undoubtedly depict not actually existing three-dimensional space but his own state of mind. But what exactly was this state of mind? What is clear is that this painting is the work of someone who is homeless. But the artist is not a mere homeless person. Both Léonard Tsuguharu Foujita and Isamu Noguchi, who were contemporaries of Kuniyoshi, were homeless. But whereas during the war Foujita went to the front and cooperated with the production of the Japanese army’s war documentary paintings, after the war he did an about-face and renounced his Japanese citizenship. He became a French citizen, converted to Catholicism and devoted himself to Christian art. And while Noguchi placed himself in an internment camp during the war as a Japanese American, he was not a Japanese citizen to begin with. Certainly, as homeless people, both Foujita and Noguchi found that their identities were constantly under threat. But Foujita was able to change his own identity like a chameleon, while Noguchi accepted being torn in two and at times even turned this condition into a weapon. Here, when I call Kuniyoshi a homeless person, I mean it in a sense completely different from these two. Despite not only remaining in the US even after becoming an enemy alien as a consequence of the war, but also cooperating with the war against Japan through art and then achieving success as an artist in America after Japan’s defeat, for various reasons including the circumstances of the times, Kuniyoshi never became a US citizen and remained a Japanese national for the rest of his life. In this sense the complexity of Kuniyoshi’s mind was fundamentally different from that of either Foujita’s or Noguchi’s, and it is unreasonable to lump him together with other Japanese artists that resided in the US. It is no wonder, then, that Kuniyoshi’s mind had become so entirely different from normal that it could not be expressed by way of normal human emotions. 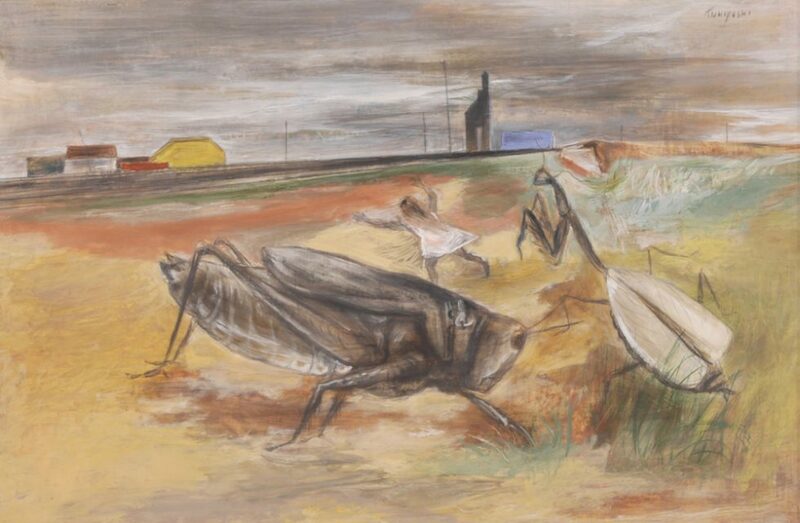 Hence his depiction of these ruinous landscapes that are something between a victorious nation and a vanquished nation not as tragedies of his homeland but as scenes in America, and his choice as his tiny protagonists of lonely-looking young girls who run for their lives from insects or play like dolls. Indeed, there are earlier works by Kuniyoshi in which one can already see signs of such an “entirely different” mind. Perhaps a perfect example, and one that is relatively well known, is Upside Down Table and Mask (1940). 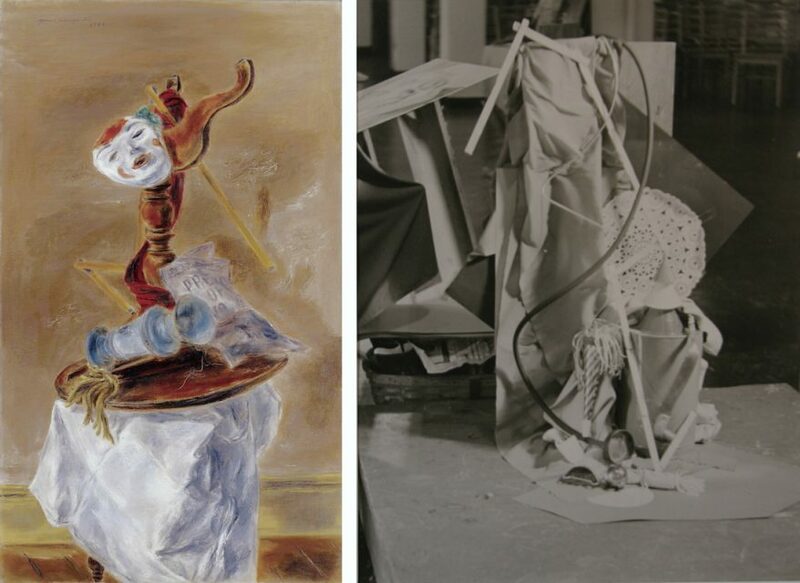 Left: Yasuo Kuniyoshi – Upside Down Table and Mask (1940), oil on canvas, 153 x 89.5 cm. Right: Yasuo Kuniyoshi – Still Life (1) (1939), gelatin silver print, 25.1 x 20.1 cm. Both: Fukutake Collection. Even assuming that this painting is a still life, the objects in it are inconsistently piled up as if gravity did not exist. In actual space, it would be absolutely impossible for objects to sit on top of each other at such angles. But the result is unlike either painterly space or figurative space; rather, it has the appearance of a value-destroying Dadaist collage. In fact, though their relationship with these early works is unclear, there exist photographs taken by Kuniyoshi that are somehow suggestive of them. And while these photographs do appear incredibly Dadaesque, given his approach to painting it would seem unreasonable to think that Kuniyoshi was somehow influenced by Dada. Moreover, even though Kuniyoshi lived in New York at around the same time as Duchamp and showed a painting at the Independent Art Society exhibition in 1917, the same year that Duchamp produced Fountain, it is inconceivable that they influenced each other directly. More than that, was not Kuniyoshi himself in the process of changing into someone possessed of an “entirely different mind” that was similarly devoid both historically and physically of proper gravitational balance? Like hinges barely supporting this peculiar mind, symbols and letters of the alphabet later crept into Kuniyoshi’s paintings in large numbers. 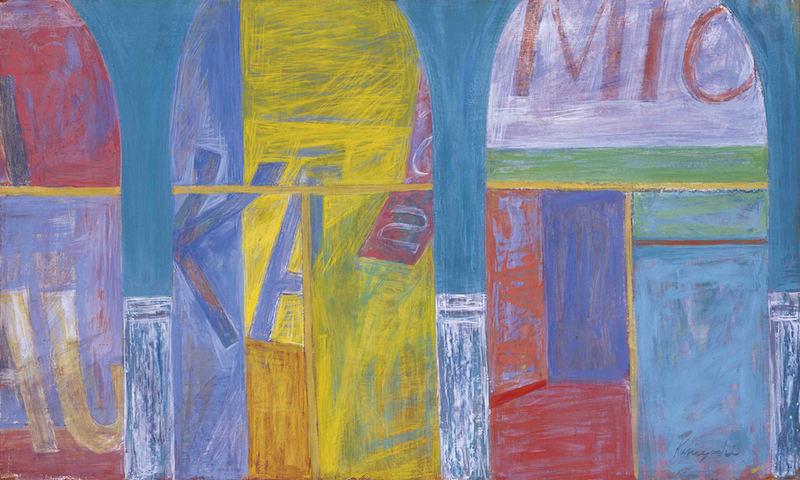 Completed in his twilight years, Across the Street (1951) features pale, bright colors emanating from a black ground and foreshadows the emergence of Jasper Johns. 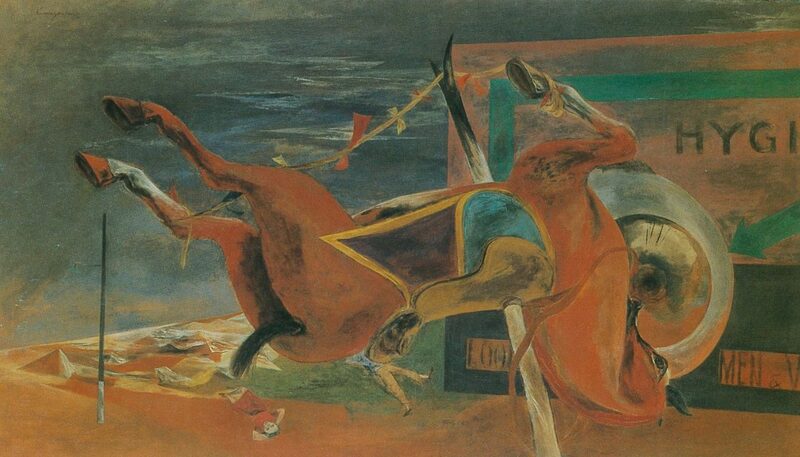 But Kuniyoshi’s approach is far from methodical. As hinted at above, it is in a sense a natural expression of the state of mind Kuniyoshi the artist had attained. 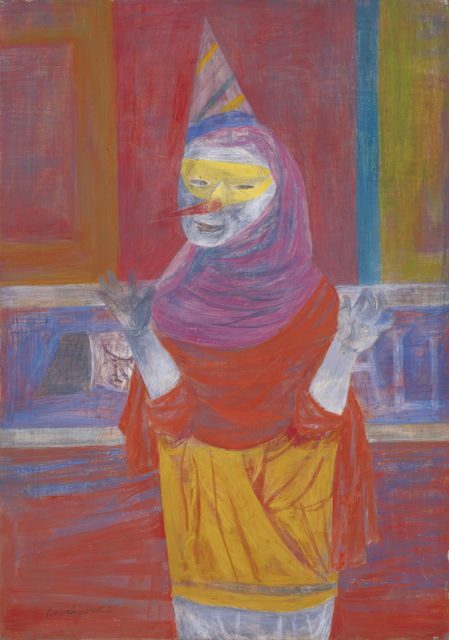 That being the case, perhaps the clowns and other figures in masks that appear so frequently in the works this artist produced in his twilight years, too, are the kinds of gestures only such a uniquely homeless person could produce. Yasuo Kuniyoshi – Across the Street (1951), casein on plasterboard, 30.2 x 50.7 cm, Fukutake Collection. Yasuo Kuniyoshi – To the Ball (1950), casein on plasterboard, 50.5 x 35.5 cm, Fukutake Collection. But why do I get the sense that the landscapes that originated from such a peculiar mind are particularly accessible today? Or perhaps it is that such a brutally clear homeless person is so very familiar to those of us alive in the 21st century. Perhaps, at a time when the “festivities” of rapid economic growth have ended, those of us who are “running for our lives” from one disaster after another and living through the recovery from these unreasonably as if it were a “playground” have in some way already lost our home of Japan while remaining Japanese. Looking at Kuniyoshi’s paintings, I cannot help but sense that at this very moment such fears are unraveling openly before my very eyes.